vacation. 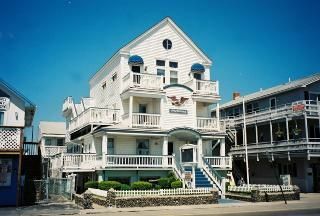 Enjoy all the comforts of home just steps from the beach. Book your stay today and save. Kitchen appliances, including microwave, toaster, coffee maker, as well as all utensils. Decks with ocean view. Outdoor shower for your return from the beach. Laundry On-Site. Free Parking. Free Wi-Fi Cable TV. The suite I occupied was very clean and efficient. Having your own kitchenette was fabulous. Being able to cook , if I felt like it was, was a great option. My unit was clean and homey. Having your own relaxing patio to people watch was a plus. I WILL definitely return to the Americana. The location of this resort is awesome. Right across from the beach and all the amenities of the awesomely renovated Hampton Strip. I would totally recommend this to anyone who have children and want to park their car and just relax all week. The unit I had was spacious, well equipped and easy to get to. Fridge, Stove, Microwave. Coffee Maker and Cable TV. What more could you need? The only thing I would say is the hotel does border a pretty busy mini-golf course which is open 11 PM on good weather days. Parking is a little challenging if you have more than one car. We parked at the parking lot next door (with Santa watching) for either 10 or 20 a day and then moved the cars later to the public parking which is free midnight until 8 AM. (The nextdoor parking doesn't really open until 9ish, but we didn't get ticketed or towed and it worked well. All in all I would recommend this resort. Very clean and great location. My grandsons had a great time there. the nicest and cleanest place we have ever stayed in. my wife and family loved it. i would like to go back at the end of august, but i can not pay for it until the 10th and 17th. let me know if you have anything available 4 adults 3 kids. We stayed for a week around the 4th of July. Close walk to everything! The beach directly across the street wasn't too congested and was a great place to watch the weekly fireworks. The beds are on the smaller side and wifi was spotty, but the apartment was clean and the owner responded immediately to fix a minor issue with the fridge. Lots of stairs to the top apartment, but the views from the front balcony are amazing and made for great people watching at night too! The Americana was a wonderful place to stay with our family. We chose the back three bedroom unit and stayed for the week of the 4th of July. What a great experience. We were 6 adults and two children under 6 years of age. The rooms offered us each the privacy we needed with the larger living area to join together. The laundry and outdoor shower were a plus. The location can't be beat; just a few steps to the beach, ice cream and other amenities. The owner was very helpful and we met new friends. We would recommend this to others. Weekly Rate: $1650 - $2200 1 Bedroom - furnished apartment, including eat in kitchen with all appliances, and deck with view of the beach. Rates - $1500 per week peak summer. Off season rates available. 2 Bedroom - furnished apartment, including eat in kitchen with all appliances, and deck with view of the beach. Rates - $1650-$1750 per week peak summer. Off season rates available. 3 Bedroom - furnished apartment, including eat in kitchen with all appliances. Rates - $1700-$2200 per week peak summer. Off season rates available.